All the stats and facts from the 3rd match of IPL 2018 between Kolkata Knight Riders and Royal Challengers Bangalore in Kolkata. 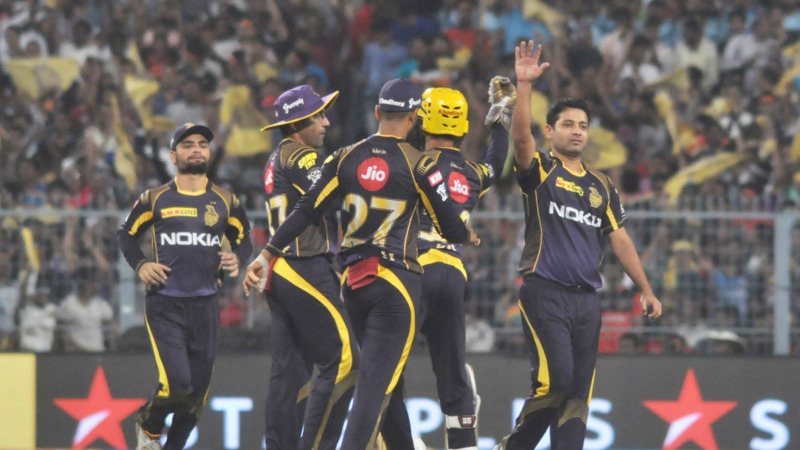 Kolkata Knight Riders began their IPL 11 campaign under new skipper Dinesh Karthik on a high note with a 4 wickets win over Royal Challengers Bangalore at home ground Kolkata. RCB managed to score 176/7 in 20 overs with the help of AB de VIlliers (44), Brendon McCullum (43) and Mandeep Singh (37). Opener Sunil Narine with a 17 ball 50 provided a perfect platform for the rest of the batsmen, captain Dinesh Karthik 35 not out and Nitish Rana 34 also helped to chase down the target of 177 runs in the 19th over. 150 - Both Virat Kohli and Robin Uthappa played their 150th game of IPL. Kohli is also the only player to feature in 150 games for a single team in the IPL. 9035 - Runs scored by Brendon McCullum in T20 cricket. He became the second player to score 9000 runs in T20 cricket after Chris Gayle. 3517 - AB de Villiers completed 3500 runs in the IPL. He is the 3rd overseas player and overall 10th player to score 3500 or more runs in the IPL. 162 - Sixes hit by AB de Villiers in the IPL. 4th most for a player in the IPL. 12 - This was 12th win for KKR over RCB in the IPL, which is 2nd most for them against an opponent in the IPL. 74 - AB de Villiers took his 74th catch in the IPL which is 2nd most for as a fielder. 3 - Nitiish Rana became the 3rd bowler to dismiss both AB de Villiers and Virat Kohli on consecutive balls in an over in the IPL after Jacques Kallis for KKR (at Kolkata in 2012) and Thisara Perera for RPS (at Pune in 2016). 17 - Sunil Narine scored his 2nd fastest and IPL's joint 5th fastest fifty in just 17 balls.